This is the last egg recipe of the week (and it is GOOD)! The other day while browsing through the store produce section, I stopped at the cauliflower: I haven’t made pizza in a while. Hmm…. born was today’s post, a delicious, easy to assemble breakfasteque pizza. Note of course that this recipe is free for interpretation and personal creativity. Add mushrooms, take away the cheese, add ham and pineapple, whatever you want, Make it Happen. Let’s Make it Happen: Heat the oven to 350. Scramble up the eggs in a bowl with Italian seasonings. Pour into a coconut oil greased cast iron skillet. Bake until it is nice and fluffy-like. Brown the sausage in a skillet and fry up the bacon (I like to use kitchen sheers and cut it into pieces first). Toss the green peppers into the sausage to saute a bit. 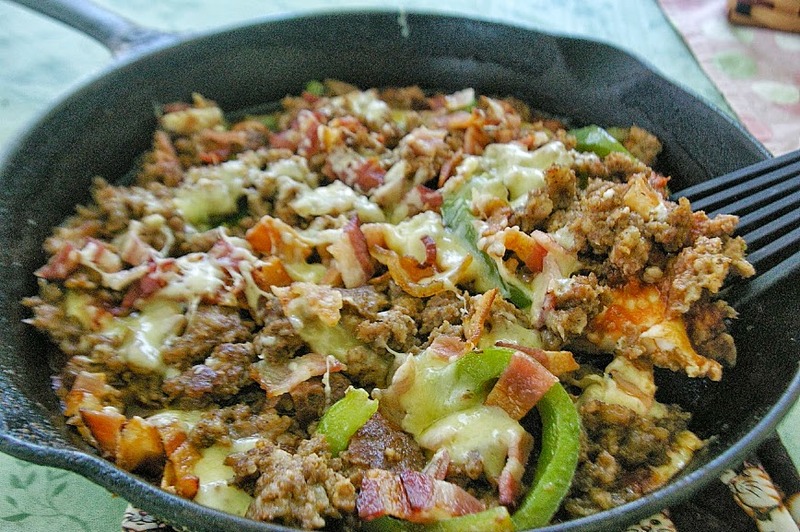 Layer onto the egg crust: salsa, sausage, green peppers, and bacon. Lastly grate some grass-fed cheese onto the top. Place back into the oven. Cook until the cheese is melted. Slice and enjoy!